The good part is most of us love eating out, and restaurants thrive on this. The restaurant industry in India is worth multi million dollars ( Rs. 450,000 crores at last count) and is only growing. Though if there’s one thing that gets most people riled up and is covered in all shades of grey, it’s how taxes on restaurant bills in India work. Go to a fancy place and the final bill amount looks like nothing you saw on the menu card. Most people are usually not aware of how exactly the additional charges like Service Tax, Service charge and VAT work. 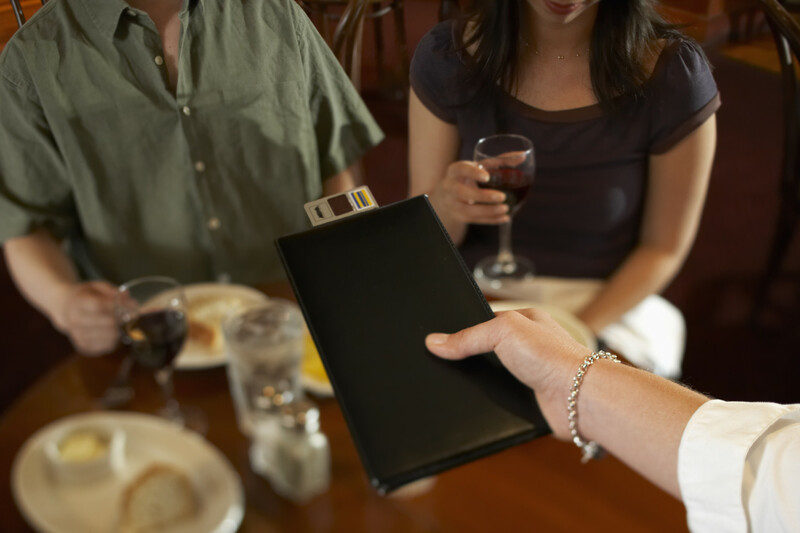 Cases of restaurants charging wrongly are not uncommon. Recently, online food ordering giant Foodpanda was taken to court over miscalculation in the food bills. 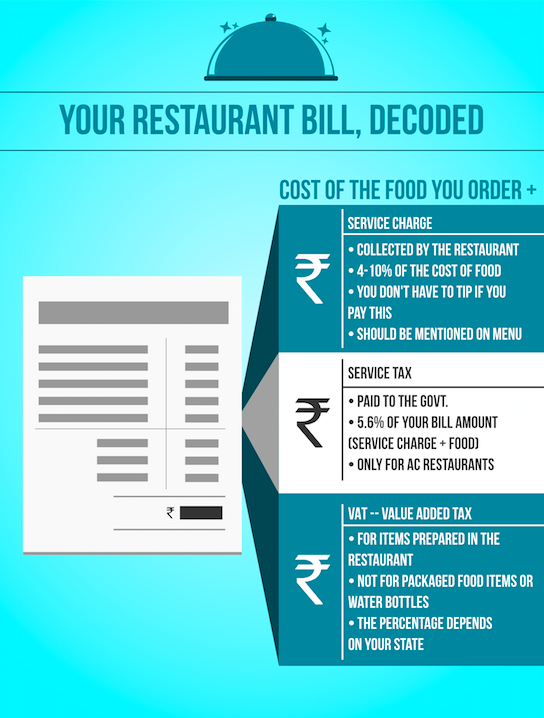 Here’s a handy guide to refer to decode your restaurant bill the next time you eat out. Service tax is paid to the government and the rate is decided by the government. Currently it’s 14.5%. ( Updated after levying of Swachh Bharat Cess). This is payable on 40 percent of your total bill, which includes food, drinks, service charge and applicable in an air-conditioned restaurant only. In simple words, service tax would be 5.8 percent (i.e. 14.5% of 40 percent) of your total bill. Make sure that the restaurant does not charge you more than 5.8% (of the total bill) as service tax and that it is an AC restaurant. Note: Home delivery restaurants cannot charge service tax. VAT is only applicable on food items that are prepared in the restaurant as they add value before serving it to you. So make sure that you are not charged VAT on packaged food items or water bottles. VAT rates are different for alcoholic beverages and other food items and is applicable only on your final bill. Also, rate of VAT tax differs from 5 percent to 20 percent depending upon the state you are dining in, because it is levied and controlled by each state separately. VAT is typically charged at 14.5% on all food items and non-alcoholic beverages (includes, juices, mocktail etc). Note: that VAT is NOT applied on the total bill after Service Tax has already been added. Service charge is what the restaurants charge you for the table service provided. This charge can be on a rate decided arbitly by the restaurant and could be between 4-10% of the bill. If you pay this, don’t pay tips. Now let’s take an example of a fictional bill. Now, I ordered a Pasta Ariabatta looking at the tempting photo on the menu, and the price at Rs. 200 sounded decent. I think a glass of wine ( Rs. 250) would be great with the pasta so I order that, along with a bottle of mineral water. (Rs. 50) The pasta comes, I devour it, sip my wine and enjoy my evening. And then comes the not so appetising part. The bill. Knowing how much I paid for definitely helps me digest my food better, than constantly grudge the restaurant for overcharging or worse, being taken for a ride.